Hey guys! So check this out, a friend, Alex, who runs peppermintplum.com asked me if I wanted to do a giveaway on her blog! Of course, I happily agreed. 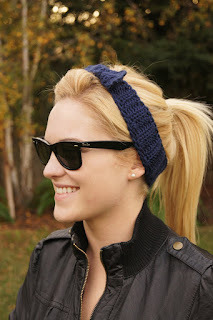 The giveaway is for one of the WWII Rosie the Riveter Headbands I make, and you can win one! All you have to do is check out the post here, become a member of Peppermint Plum (you must be a member to enter the giveaway), and leave a comment on the post telling us which color you would love to have! But have no worries, if you don't win you can buy the headband here for only 13$, or, buy the pattern here for only 3$!! So check it out! Good luck!! !